A sequel fourteen years in the making, and one of the biggest box office hits of the year, Incredibles 2 is arriving on Blu-ray this week. I found this to be an incredibly entertaining animated sequel, and for more on the film itself, you can read my full review of Pixar’s latest right here. The Blu-ray comes with a very generous amount of bonus features, spread over two discs. Along with the film itself, the first disc includes the unique short film Bao, which played with the film in theatres and is directed by Toronto’s own Domee Shi; as well as the new short film Auntie Edna, a delightful piece focusing on Edna Mode babysitting Jack-Jack that feels like it could have easily been an extended sequence in the film itself. Next is the excellent featurette Strong Coffee: A Lesson in Animation With Brad Bird, which functions as both an in-depth look at the production of Incredibles 2 from the perspective of the acclaimed writer-director, as well as an overview of Bird’s early career as an animator being mentored by the old masters at Walt Disney Studios. There is also a commentary track featuring several of the animators who worked on the film. The second disc is devoted entirely to bonus stuff, starting off with five featurettes. Super Stuff looks at the rich design of the film’s world, from the retro futuristic set design to diverse background characters; Paths to Pixar: Everyday Heroes features members of the cast and crew talking about their own kids and how they see their own families reflected in the film; Superbaby of course focuses on Jack-Jack, with Frankie and Paige of Bizaardvark acting as incredibly annoying hosts; Ralph Egglestein: Production Designer is a brief look at what the job of a production designer entails; and Making Bao offers a good look behind the scenes of the short film, and how personal the production was for Shi. Next up, under a tab entitled “Heroes & Villains,” we get brief introductions to the many characters in the film and their various powers and personalities, including Mr. Incredible, Elastigirl, The Parr Kids, Frozone, Edna Mode, Winston Deavor, Evelyn Deavor, and the Wannabes, a selection of new superhero characters. Next up we have a trio of fake, vintage toy commercials for Mr. Incredible, Elastigirl and Frozone, as well as theme songs for each of these three characters. Finally, the disc includes the ten deleted scenes Suburban Escape, Kari Revisited, Return of the Supers, Chewed Out, Late Audition, Slow Day, Frozone and Honey, Restaurant Robbery, Fashion Show and Secuirity Breakdown, which are preceded by a short introduction from Bird. There are also several trailers for the film, including the global teaser and trailer for the film, the Japanese theatrical trailer, and a montage of different TV promos for the film. It’s an excellent set all around. 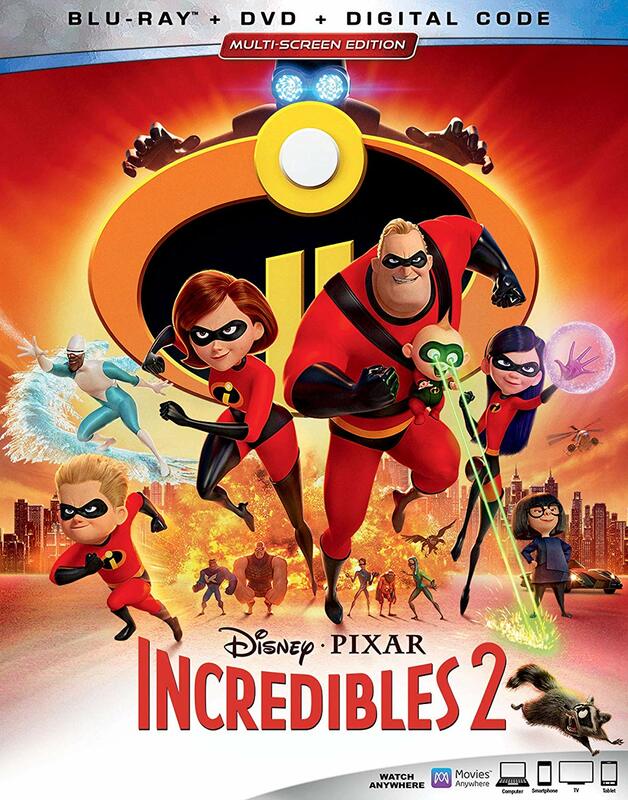 Incredibles 2 is a Walt Disney Studios Home Entertainment release. It’s 118 minutes and rated PG.